" Is Kindle Unlimited the best, or should self-publishers join the Scribd or Oyster programs instead?" Unlimited’s catalog consists of 85 percent self-published books, so despite Amazon being the world’s biggest bookstore, your title is not likely to be ever-so-temptingly displayed aside those of the Big 5 publishing companies. In fact, there’s no chance of that at all for the foreseeable future. It’s no secret that Big 5 Pub doesn’t like Amazon, and with that big ugly duke-out with Hachette going on now, everybody seems to be stuck in a holding pattern. Readers who are aware of this may decide not to join Unlimited. But do readers look at the publishing house or the price? According to the latest Author Earnings report, self-published authors are now responsible for 31 percent of Amazon’s total daily e-book sales across all genres. 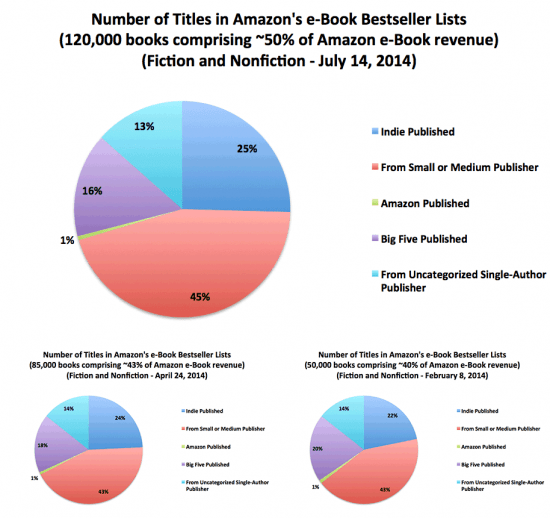 This makes indie authors, as a group, Amazon’s largest market share. From the July 2014 Author Earnings Report from Author Earnings. At the end of 2010 I bravely stated that self-publishing had lost its stigma, and these stats prove that many of the reading public has started to agree. Or are the high numbers for indie books simply a reflection of consumer attraction for low-priced e-books? The reason indie authors should be interested in reader psychology is that we need to be where the readers are. So let’s look a little deeper into another factor that may affect their buying decisions. Many Amazon customers are members of the $99/annual Amazon Prime program. These customers are a little confused right now. They already have access to the same books (along with streaming movies, music free shipping, and other perks), albeit only via an actual Kindle device, and they can only borrow one book a month. Unlimited lets readers have 10 books at a time via a Kindle device or other devices using a Kindle app. Despite all these caveats, Amazon has earned its claim to the “World’s Largest Bookstore.” Naturally, authors want to be there, too. How to get in: Join the exclusive KDP Select program. Who’s there: Unlimited offers readers 600,000 titles with 85 percent of them by self-published authors and the rest from small press, plus 2,000 audiobooks from Amazon’s Audible business. Subscription price: $8.99/month, free 30-day membership. Devices: All Kindle devices including dedicated e-readers, plus smartphones, tablets and computers via the Kindle app. Read calculation: Authors are paid when Amazon determines that 10 percent of the book has been read. Author payment: Authors are paid a percentage of a monthly pool that it shares with the Kindle Lending Library. That percentage is based on number of reads. The pool was set at $2 million in July 2014 for the launch of Kindle Unlimited. San Francisco-based Scribd is a document sharing-site that was founded in 2007. Early on, the company differentiated itself by specifically serving the author community and developing the sales, distribution and publishing side of their business. As an author, I was immediately attracted by their e-book sales platform and robust social publishing tools. It was very easy to attract beta readers and the site encouraged conversation with other authors. Though those features are not as prominent as they once were, I still describe Scribd is as kind of a Wattpad for grownups, with the bonus of being able to sell your work. How to get in: E-book aggregation via Smashwords or BookBaby. Who’s there: 500,000 books from self-publishers plus books from nearly 1,000 publishers including HarperCollins, Simon & Schuster, Lonely Planet, Wiley (“Dummies” series), Workman, Perseus, National Geographic, Rosetta Books and Kensington. Subscription price: $8.99, free 30-day membership. 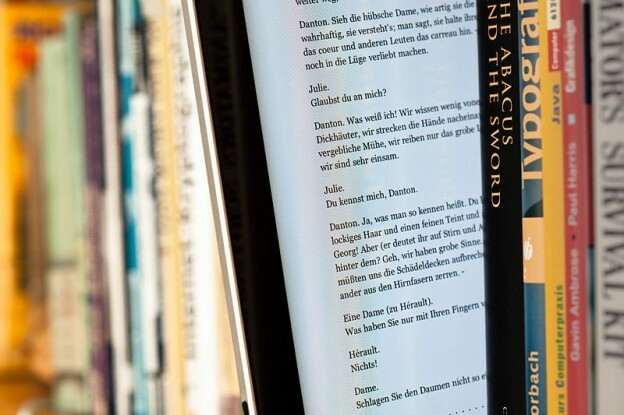 Devices: Readers can enjoy your books in any Web browser and via the Scribd app for smartphones, tablets and computers. Books are not available for reading on dedicated e-readers like the Kindle Paperwhite, Nook or Kobo Touch. Read calculation: When Scribd’s algorithm determines that 30 percent of your book has been read you are given credit for a full sale. In addition, for every 10 “partial reads” (between 15 percent and 30 percent), a full sale credit is given. Author payment: There is no payment for a “preview” read of between 10 percent and 15 percent of the book. Authors distributing via Smashwords earn 60 percent and enjoy a free, one-year subscription to Scribd. BookBaby authors in the Premium package earn 70 percent from Scribd with BookBaby earning 0 percent. Authors in their Free or Standard package earn 70 percent minus 15 percent to BookBaby for a total of 55 percent of the book. Oyster was launched in 2013 and is headquartered in New York. Of the three subscription services, it alone is a single-purpose reader subscription program. With half a million titles and 1,600 publishing partners, Oyster claims to be the leading e-book subscription service and the fifth-largest e-book retailer in the U.S.
How to get in: Use Smashwords or BookBaby aggregation services. Who’s there: 500,000 titles, half of which are self-published titles with 1,600 publishing partners including HarperCollins, Simon & Schuster, McSweeney’s, Chronicle, Grove Atlantic, Disney and Rodale. Devices: Apple, Android, Kindle Fire and Nook HD and, as of last week, on all desktop and mobile Web browsers. Not available for dedicated e-readers like the Kindle Paperwhite, Nook or Kobo Touch. Subscription price: $9.95, free 30-day membership. Read calculation: The publisher is paid upon completion of a 10 percent read. Author payments: Authors receive about 60 percent royalty via Smashwords. BookBaby authors in their Premium package earn 70 percent from Oyster with BookBaby earning 0 percent. Authors in BookBaby’s Free or Standard package earn 70 percent minus 15 percent to BookBaby for a total of 55 percent of the book. Unless you’ve chosen to use the exclusive Amazon KDP Select program for the reasons described above, I recommend that you run out right now and get your books into both Scribd and Oyster. Enter the programs via one of two great e-book aggregation services: Smashwords or BookBaby. You can sell on both Oyster and Scribd at the same time, but Unlimited requires exclusivity. If you’ve decided to use KDP exclusivity to boost a book launch, go for it, and when it’s finished, get your books into the other two programs. Oyster is very popular with the reading public, but I remain most impressed with Scribd, which claims to have already overtaken Oyster in revenue share and last week matched its catalog with half a million books. But I have also long admired them for their social and selling features. (See my article way back in May 2010 on How to Pair Smashwords and Scribd for Ideal E-Book Strategy. Scribd’s social publishing tools have taken a back seat to the bookselling and subscription programs but they still appear in the My Uploads area of user profiles. I find this a great place to deposit supplemental materials, drafts of stories and presentations. These materials also link to my books for sale. The Scribd embed widget is particularly useful as it lets you display a preview of your book, complete with BUY NOW button, on Web pages and blog posts. You can even encourage others to grab the widget. This is especially nice if you’re guest blogging, because readers can page through your book without clicking off the post. For example, here’s how the embed widget displays my Self-Publishing Boot Camp Guide for Authors. Consider subscription programs as yet another sales tool. You can’t lose, whichever you choose, and you can choose both Oyster and Scribd together over Unlimited. The big bonus with Scribd is their toolset that helps you build platform, find your audience, connect with other writers, market your work and enjoy reader feedback, all while making more money as an author. Keep up to date with blog posts from Scribd, Oyster, Smashwords and BookBaby. Carla King is an author, a publishing consultant, and founder of the Self-Pub Boot Camp program providing books, lectures, workshops and support for indie authors. Carla has self-published her adventure travel stories since 1994 on the internet and in print. She authored PBS MediaShift’s How to Self-Publish Your Book: A Practical Guide to Creating and Distributing Your Ebook or Print Book, which describes today’s self-publishing landscape. A great companion book is her step-by-step Self-Publishing Boot Camp Guide for Authors, found on SelfPubBootCamp.com/books/.